This coffee cake is baked with a strawberry rhubarb layer in the center and a crunchy crumble topping. In a large saucepan combine rhubarb, strawberries and lemon juice. Cover and cook over medium heat for about 5 minutes. Combine sugar and cornstarch; stir into strawberry rhubarb mixture. Bring to a boil over medium heat, stirring constantly until thickened; remove from heat. In a large bowl, combine flour, sugar, baking powder, baking soda and salt. Cut in the pieces of butter with a pastry blender until mixture resembles coarse crumbs. In a separate bowl, beat together buttermilk, eggs and vanilla; stir into crumb mixture. Spread half of the batter evenly in a greased 9x13x2-inch baking pan. Carefully spread filling over the batter. Heat the oven to 350° F (180° C/Gas 4) . In a small saucepan over low heat, melt butter. Remove saucepan from heat; stir in flour and sugar until mixture is crumbly then sprinkle over batter. Lay foil on lower rack to catch any juice spillovers. Bake for about 45 minutes, or until cake is done. Cool cake in pan on rack. 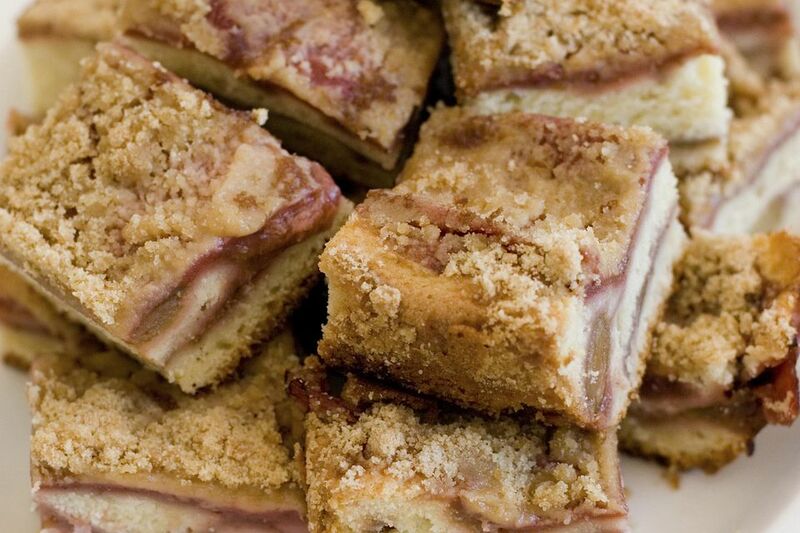 Cut rhubarb coffee cake into squares to serve.